Temperatures can be adjusted directly on the thermostat by touching the up and down arrows on the front. If thermostat is using “Heating schedule”, this will be overwritten when controlled by the scheduled actions. The temperatures desired for when you are at home and away or asleep can be set individually for each room using the DEVI Smart App. 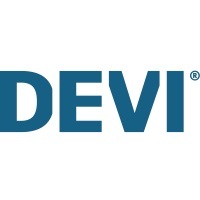 Access the right side panel of the DEVI Smart App. a. Click on the pencil to change the current temperature for any room on the list. If thermostat is using “Heating schedule”, this will be overwritten when controlled by the scheduled actions. b. Click on a [room name] to view both "At home" and "Away and Asleep" temperatures for that room. This will change the temperatures permanently until you change it again in the same way.